Last night, we visited the Zoo to see their annual Fantasy of Lights. You drive through the backside of the zoo to view the displays. My favorite was the tigers. Maggie really wanted to see the Rudolph display which was not part of the drive, but inside the zoo. 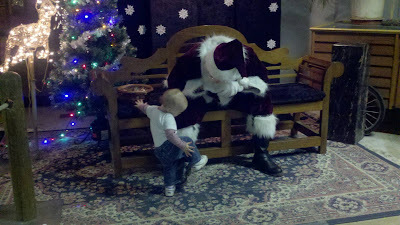 After completing the loop, we went inside for hot chocolate, crafts & Santa!! Maggie wasn't sure about visiting with him again, but did sit on his lap so we could get a picture with Jessie. Which ended up including me (we'll get a copy of it on Monday). Later while Maggie was enjoying her hot chocolate Jessie decided to check him out again. She had to show him her shoes and I was able to get a quick photo! Maggie enjoyed the crafts, but was very excited when we FINALLY went outside so she could see the Rudolph display. One red light led her to him. It was a nice way to spend a Saturday evening and a kick off to the Holiday Season. This may become an annual event for us.